Learn how to make your service available worldwide with few easy steps! In this example you will deploy two APIs in two AWS regions — eu-central-1 and us-east-1. If your service operates in many countries/continents, there is fair chance that at some point you will want to go global to lower latency and maybe spread the traffic a bit. Latency routing helps you in a way that it decides how your traffic should be routed to provide lowest latency to users. You also get failover out of the box, but you need to create health checks in a way that ensure your service is really up. In order to do it, you need to perform deep health checks that check not only your service, but also underlying services and infrastructure. In this example we are going to create a simple lambda function attached to an API Gateway, which is then connected to Route 53 using Custom Domain. endpointType: REGIONAL means that your API Gateway will not be edge-optimized. Edge-optimized API Gateway creates implicit CloudFront distribution under-the-hood that you can’t modify, so it only gives you ability to use CloudFront edge-locations (which might be all you need in some cases), but if you need more CloudFront features, then it’s better to create one yourself that utilizes your Regional API Gateway (more here). ACCOUNT_ID — id of your account, probably there is a way to get it using CloudFormation but I couldn’t find it after quick research — let me know if you know a way to populate it! CustomDomain: to attach Route53 record to your API Gateway, first, you have to generate CNAME record — it also applies if you want to attach domain that’s not available on your AWS account. You basically let API Gateway know that this service is going to be available under different domain, for example sls-latency.example.com. RegionalCertificateArn has to match this domain, for example it needs to be generated for *.example.com. It also needs to match the region — if you create your service in three different regions you have to import this certificate to each of those. 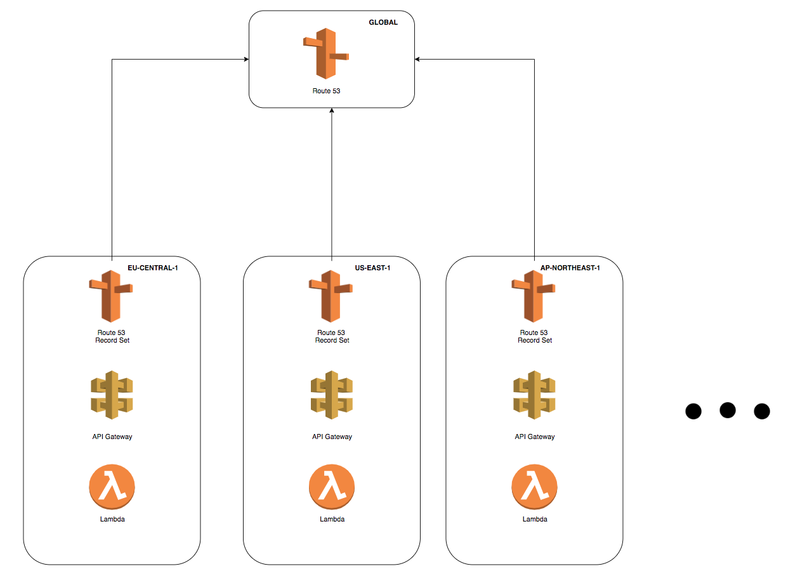 ApiGatewayDeployment: this resource is automatically created by Serverless BUT in order to add your API to Route53 we need to override its basic behaviour - your lambda functions need to be ready to serve traffic and your custom domain have to exist to consider API Gateway deployment as done. That’s why clause DependsOn is added — without it, first execution of your CloudFormation stack would fail, because it would try to attach your API Gateway to Route53 when it’s not ready yet. Route53HealthCheck: with latency routing you have to provide endpoint that’s going to be used as health check but also to measure latency in your endpoints. Out of the box, AWS every 30 seconds will hit this endpoint from predefined list of regions (you can override it) and will check what is the latency, and if this API is up and running — that’s why you should have deep health checks. After two failed requests, so after one minute, your traffic is going to be rerouted to the nearest region that’s up and with next lowest latency. Route53Record: this is the place where it all comes together. We are adding actual record to Route53 hosted zone with the name of your custom domain. TTL is set to 60s because your client after every 60 seconds should check again if region didn’t change in case the one currently used is down. As expected, since I’m based in Europe, AWS responded with eu-central-1 region. After up to 2 minutes (1 minute for health checks to pick up issue, and 1 minute for Route53 TTL to timeout) you will see that your other region took over the traffic. Also, your health checks are going to start showing this region as unhealthy. This is my take on creating Latency Routing with Serverless, if you have any questions, suggestions for improvement or it helped you, let me know with applaud or in comment section!